Arena 7 Witch Deck - Pushing from 1900 to 2400+ Trophies! 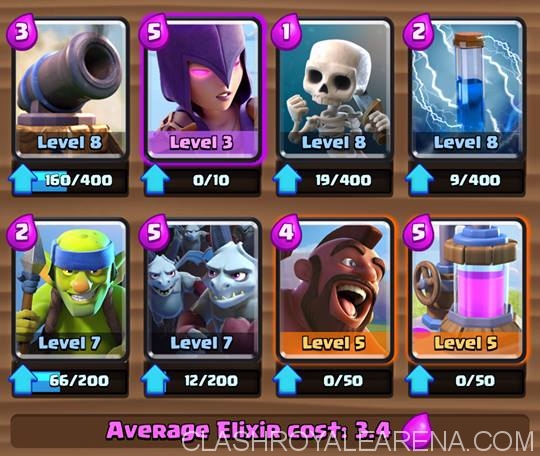 Arena 7 Witch Deck – Pushing from 1900 to 2400+ Trophies! I’ve been playing this Arena 7 Witch Deck a lot recently and have had pretty good success with it (Climbed from 1900-2400 basically only losing 3 matches). I hope you will like this Witch as there aren’t many decent Witch decks right now. Thanks NA_Edxu very much for sharing this deck with us! Let’s do some math on Witch. If we value Skeletons x4 at 1 elixir, each skeleton is worth ~0.25 Elixir, which means that for every spawn that the Witch gets, she effectively costs you 0.75 elixir less, since she spawns 3 at a time. The actual witch has about the same damage as a +5 level Archer x1, but has about double the health, so the Witch’s body is worth about the same as a 3-elixir Archers play in the long run. While other units give you “elixir advantage” by trading up (Arrows -> Minion Horde for +2 advantage), the Witch functions similarly to a hut by generating elixir AND creating elixir advantage. Witch should be played behind a Hog Rider or behind spear gobs so that she can keep spawning while the gobs/Hog Rider tank, as the skeletons that she spawns have absolutely ridiculous dps when unanswered. Cannon is in the deck to improve our matchup against Hog Rider decks and to allow us to play a little bit more greedy with elixir collectors. Cannon should mostly be played in the center to draw aggro on defense, but you can also play it right on the river to help supplement your force’s damage when a fight breaks out on the river bridge. Zap is a Swiss army knife in the deck. It greatly damages Minion Horde so that witch/spear gobs/tower can one-shot them, creating a large elixir advantage and opportunity for counter push. It can also reassign mortar aggro from your tower to a Cannon that you place right in front, possibly saving you a few hundred health. It can be used to briefly stun the Wizard, reassigning its aggro to the closest unit, hopefully your Hog Rider. Lastly, it can be used on defense against Prince/Dark Prince to stop their charge ability and give you some breathing room. Skeletons are in the deck to cycle through the deck and supplement pushes with Spear Goblins. A staple early-game harassment play in this deck is Spear Goblins -> Skeletons behind. At 3 Elixir, your opponent won’t want to spend a Zap/Arrows to stop the push and will often end up letting it go, giving you ~450-500 damage on tower for the low low cost of 3 Elixir. I’m not going to talk about Spear Goblins, because basically every deck has them and many other players are more knowledgeable than me. I recommend Orange Juice’s guide on advanced spear goblin tech. 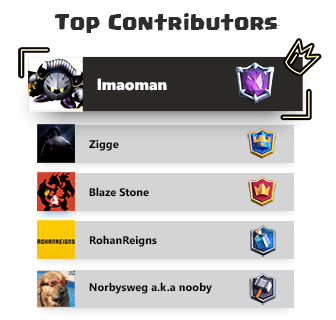 Minion Horde is in the deck to destroy unsupported ground-based forces like P.E.K.K.A, Golem, Barbarians, Bomb Tower etc. I try to avoid playing these until I know the opponent’s entire deck, because they’re so easily countered by Arrows or Zap. Hog Rider is used mainly as a split push supported by Skeletons/Gobs when the opponent commits to a lane (eg P.E.K.K.A drop, Golem drop, Mortar drop), and this will force your opponent to answer, so you can take out their drop in the other lane with relative ease. Elixir Collector so that you can get the burst of Elixir needed to cycle through and play double witch when you want to push. Also usable on defense against Balloon/Giant Skeleton/Hog Rider in an emergency. Always try and play it in the middle of your side, favoring castle to draw aggro from both towers on attackers. Mortar Decks: If you see bomb tower/inferno tower/Tesla being dropped randomly on the bridge, immediately commit to the other side with Hog Rider + whatever you’ve got. 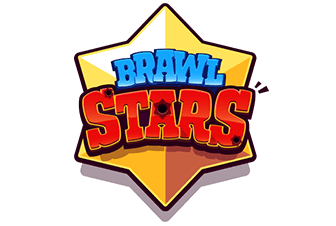 Because they committed a key defensive building to defending their Mortar, their defense is weakened and you can break through. Most Mortar users only commit when they have Mortar in hand, so that means that 1/4 of their hand is mortar, giving them less answers to your push. Golem/P.E.K.K.A/Fat Tank: Right about when their tank crosses the river, send Hog Rider+Gobs+Skeletons on the other side and drop Minion Horde on top of the tank. This will force them to multitask between answering your push or committing to their push. Most of the time, they’ll be hovering Wizard/Bomber, so they might panic play the Wizard on the Hog side and their Giant will die for free to the Minion Horde. -Three Horsemen Deck(Hog/Prince/DP): You’ll want to try and manipulate aggro for this matchup. All three are easily countered by Minion Horde, but using the Cannon to split the Hog Rider will make your life a lot easier. Witch can be used to pull the Prince/DP across the lane and force them to travel a lot while massively overkilling skeletons. This Deck: I’ve never played against this exact deck on ladder, but I’d imagine that you hold Witch/Zap to break Minion Horde and go on a hard counterpush with Hog Rider tanking and gobs/witch bringing up the back. Hold Skeletons and Cannon to kill Hog Rider when it comes. If you have any questions or suggestions, please pm me. I’d love to hear your opinions! Golem Hog Deck… Oh Wait?